On the occasion of the recent 60th anniversary of the Montgomery Bus Boycott, NPR’s Michel Martin held an important and far-reaching panel discussion at the historical Dexter Avenue King Memorial Baptist Church, with a live audience and also aired live on NPR. Panelists included historian Taylor Branch, Alabama State University president Gwendolyn Boyd, Ebony Howard of the Southern Poverty Law Center, and Reverend Bob Graetz, pastor of Trinity Lutheran church during the boycott and author of A White Preacher’s Message on Race and Reconciliation (NewSouth Books, 2006). Martin noted that the Bus Boycott anniversary comes at a time in American history where the public has seen numerous acts of violence against African Americans both in mass shootings and police brutality. At the same time she pointed out that reactions to those events suggest rising activism and the birth of a new civil rights movement. Branch and President Boyd also discussed the various origins of the Bus Boycott, including that Alabama State University teacher JoAnn Robinson and other female teachers used school resources to print flyers advertising the boycott, an act that risked their jobs, and also that the NAACP’s E. D. Nixon gathered local pastors to discuss the boycott, and these initiatives ultimately merged into the year-long movement. Boyd also discussed Rosa Parks’s role as NAACP secretary and how she and civil rights lawyer Fred Gray had discussed beforehand the need for a test case toward desegregating Montgomery buses, which Gray also relates in his memoir Bus Ride to Justice. The panel discussion moved to issues of access to education for African American students, and Martin also brought in Karen Jones, credited as founder of the Black Lives Matter movement in Montgomery. Howard described a recent court case that she won banning the use of pepper spray to punish predominantly African American students in Birmingham, AL schools. 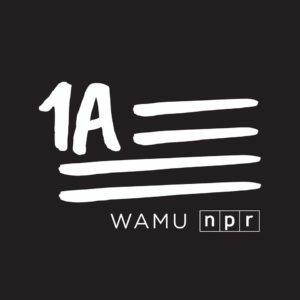 The full discussion is available for listening from NPR. Rev. 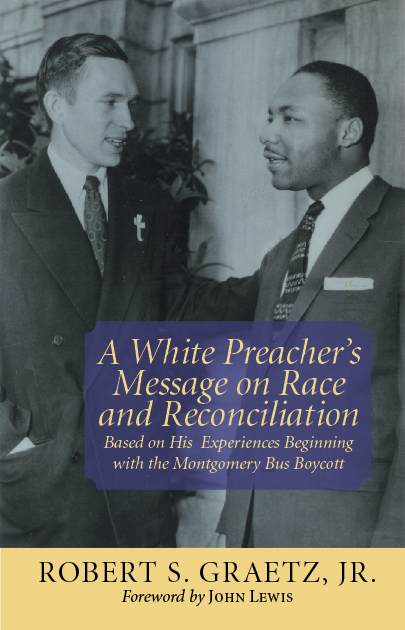 Robert Graetz’s memoir, A White Preacher’s Message on Race and Reconciliation: Based on His Experiences with the Montgomery Bus Boycott, is available in print and ebook from NewSouth Books or your favorite bookstore. Civil rights attorney Solomon S. Seay Jr. of Montgomery has died at age 84. Seay was the son of the Reverend Solomon S. Seay, a mentor to Dr. Martin Luther King Jr. and one of the architects of the Montgomery Bus Boycott. The younger Seay graduated from Howard University Law School and opened his law office in Montgomery in 1957, shortly after the end of the boycott, just in time to play a key role in the escalating battles against Jim Crow segregation in education, housing, public accommodations, and other areas. Over the next half-century, attorney Seay, often in collaboration with his longtime law partner Fred D. Gray and/or the NAACP, ACLU, and other civil rights groups, won landmark rulings in scores of legal cases. 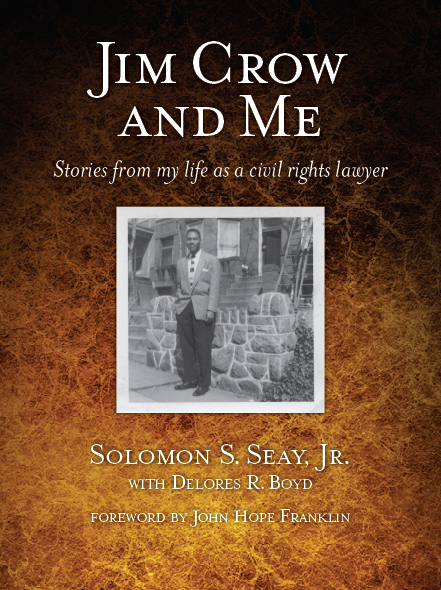 Seay describes his work and shares his observations about the people and times in his eloquent and witty memoir, Jim Crow and Me: Stories from My Life as a Civil Rights Lawyer (NewSouth, 2009). A large crowd, including friends and fellow lawyers and judges from across the nation, gathered at the Church of the Ascension on September 19 for a memorial service, with burial following in a local cemetery. Jim Crow and Me is available from NewSouth Books or your favorite bookstore. NewSouth Books joins the chorus of voices mourning the recent passing of Lynn Huntley, former president of the Southern Education Foundation. For two decades, Lynn brought effective, creative leadership to the SEF, which has long been a powerful force for improved education, better race relations, and greater understanding in our region. SEF VP Steve Suitts (author of NewSouth�s Hugo Black of Alabama) directed us to this post on the Southern Education Foundation website that remembers Lynn and also includes an essay she wrote for the World Conference Against Racism and Xenophobia. Lynn�s essay, “A Message to the Next Generation,” is as timely today as it was when she wrote it for the youth conference in South Africa in 2001. The SEF post also included a link to a video of Lynn speaking to the first class of the Southern Education Leadership Initiative (SELI), which we’ve embedded below. NewSouth Books mourns the untimely loss of our friend and noted civil rights leader Julian Bond, who died over the weekend at age 75. Bond was one of the organizers of SNCC (the Student Nonviolent Coordinating Committee), President Emeritus of the Southern Poverty Law Center, national chairman of the NAACP, a longtime Georgia state senator, a founder of the Institute for Southern Studies, a distinguished professor of history, and an internationally known lecturer, writer, and commentator. Bond wrote forewords and commentary for several NewSouth titles, including the autobiography of fellow SNCC member Bob Zellner, The Wrong Side of Murder Creek. 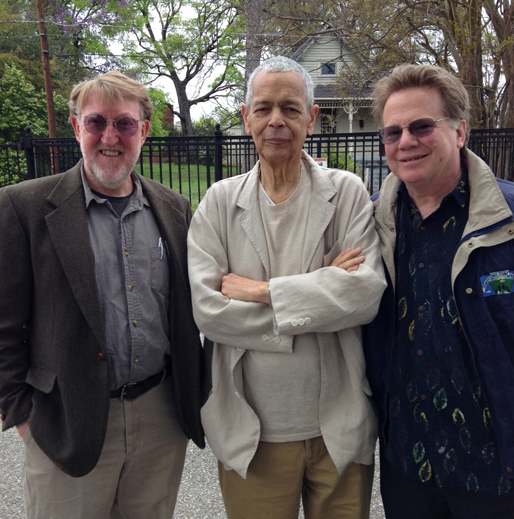 Bond is pictured in March 2015 with NewSouth editor-in-chief Randall Williams (left) and Will Campbell, an attorney from Lancaster, Pennsylvania, during a bus tour Williams was narrating of civil rights sites in Montgomery and Lowndes County. This was part of a civil rights study tour that Bond and his wife, Pamela Horowitz, hosted for the University of Virginia each spring. Horowitz, Williams, and Campbell were staffers at the Southern Poverty Law Center in the 1970s, while Bond was SPLC president. Civil rights activist and folk singer Guy Carawan died on May 3 after a long illness. Guy and his wife Candie co-authored Sing For Freedom: The Story of the Civil Rights Movement Through Its Songs, published by NewSouth Books in 2007. Guy Carawan’s legacy will continue through the Highlander Research and Education Center with which he was closely associated, and the song that continues to be performed 55 years after he taught it to young activists. Sing For Freedom is available from NewSouth Books or your favorite bookstore. 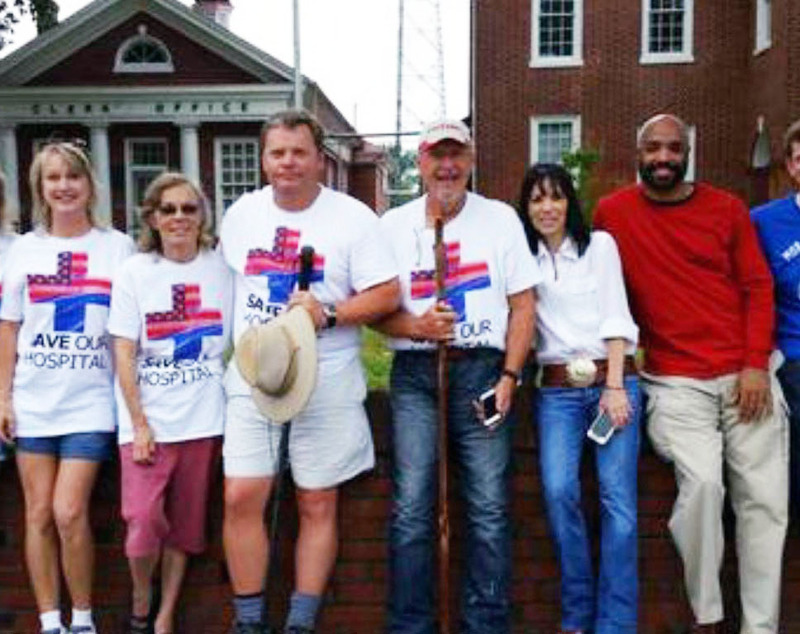 The USA edition of the British paper The Week featured Bob Zellner (pictured fourth from left) — author of The Wrong Side of Murder Creek: A White Southerner in the Freedom Movement, published by NewSouth Books — in a article on the partnership between a conservative and a progressive activist advocating on behalf of rural healthcare, an endangered species. Democrat Zellner and his friend Adam O’Neal, the Reublican mayor of Belhaven, North Carolina, were interviewed by Jonathan Wilson-Hartgrove about an arduous and sometimes lonely two week-long walk from Belhaven to Washington, D.C. the pair made in the summer of 2014 to draw attention to the demise of rural hospitals caused by states’ refusals to expand Medicaid. The walk will be made again beginning June 1, with the men planning this time to be accompanied by 283 walkers representing the number of hospitals closed. More information on the walk is available at the Walk from NC to DC website. The protest began when a Belhaven resident died waiting for transport to a hospital after the local hospital was closed due to lack of state funding. Bob Zellner has spent a lifetime working on behalf of the underprivileged. 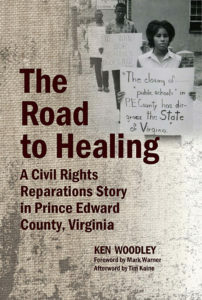 His life story from his years in SNCC to his current work is recounted in The Wrong Side of Murder Creek. The Wrong Side of Murder Creek is available from NewSouth Books or your favorite bookstore. Guy and Candie Carwan, authors of Sing For Freedom: The Story of the Civil Rights Movement Through Its Songs, published by NewSouth Books, were honored recently by the East Tennessee Historical Society, the Tennessee Archive of Moving Image and Sound, McClung Historical Collection, and the Knox County Public Library with a celebration of their work for social justice. The program included a photography exhibit, showing of rare video footage from the civil rights era, and a musical performance. The Carawans have been associated with the Highlander Research and Education Center, a leading social justice organization, since the 1950s, organizing cultural workshops and serving as consultants to the school. According to the Knoxville News Sentinel, “the Carawans were almost the face of the center for many people.” The couple were popular folk musicians who adapted traditional songs with new lyrics about the civil rights struggle. 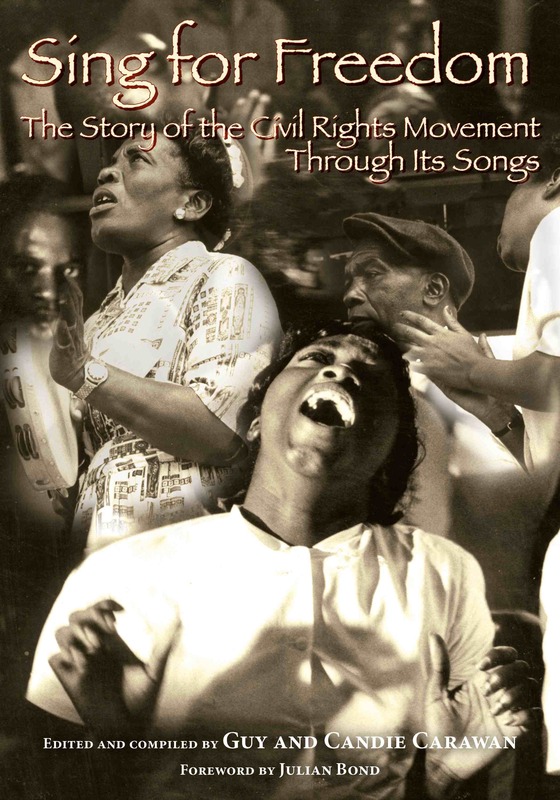 These songs were collected into two collections, We Shall Overcome (1963) and Freedom is a Constant Struggle (1968), reprinted in a single edition by NewSouth Books in 2007. The News Sentinel interviewed Candie Carawan in connection with the program showcasing their career. 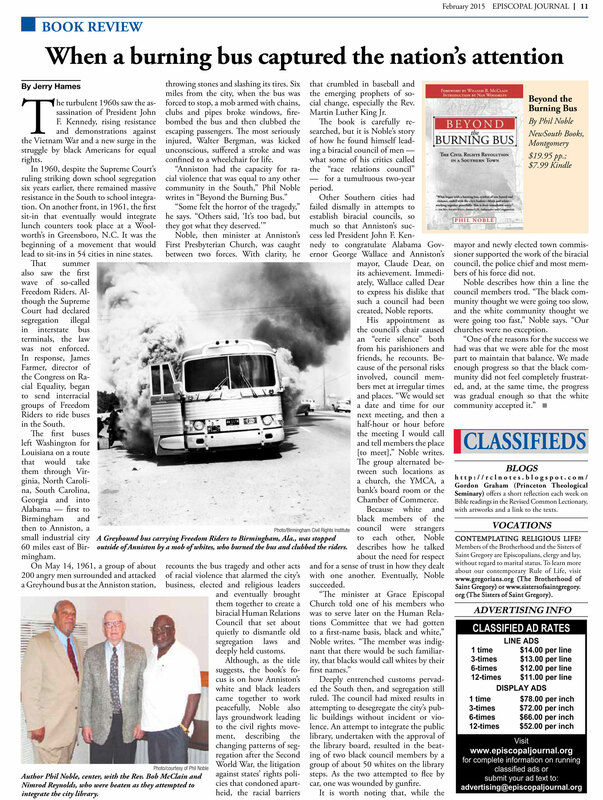 The February 2015 edition of the Episcopal Journal offers a full-page feature on Reverend Phil Noble’s book Beyond the Burning Bus: The Civil Rights Revolution in a Southern Town, and the events in Anniston, Alabama, that lead to the city’s formation of the Human Relations Council. With racial tension in the news and resurgent interest in the Civil Rights Movement with the release of the movie Selma, Noble’s first-hand account of the violence and reconciliation in his town remains required reading. The Day1 religious blog also posted an excerpt from Noble’s book. The violence so alarmed Anniston’s religious, business, and political communities that they created the biracial Human Relations Council, with Noble appointed as the council chair. As the Episcopal Journal recounts, from Beyond the Burning Bus, Noble’s committee would vary their meeting times and locations for fear of those who disagreed. “We would set a date and time for our next meeting, and then a half-hour or hour before the meeting I would call and tell members the place [to meet],” Noble writes. The group alternated between such locations as a church, the YMCA, a bank’s board room or the Chamber of Commerce. Because white and black members of the council were strangers to each other, Noble describes how he talked about the need for respect and for a sense of trust in how they dealt with one another. Eventually, Noble succeeded. Deeply entrenched customs pervaded the South then, and segregation still ruled. The council had mixed results in attempting to desegregate the city’s public buildings without incident or violence. An attempt to integrate the public library, undertaken with the approval of the library board, resulted in the beating of two black council members by a group of about 50 whites on the library steps. As the two attempted to flee by car, one was wounded by gunfire. It is worth noting that, while the mayor and newly elected town commissioner supported the work of the biracial council, the police chief and most members of his force did not. Noble describes how thin a line the council members trod. “The black community thought we were going too slow, and the white community thought we were going too fast,” Noble says. “Our churches were no exception. Read the full Episcopal Journal book review at the link. You can also read an additional excerpt from Beyond the Burning Bus at Day1.org. 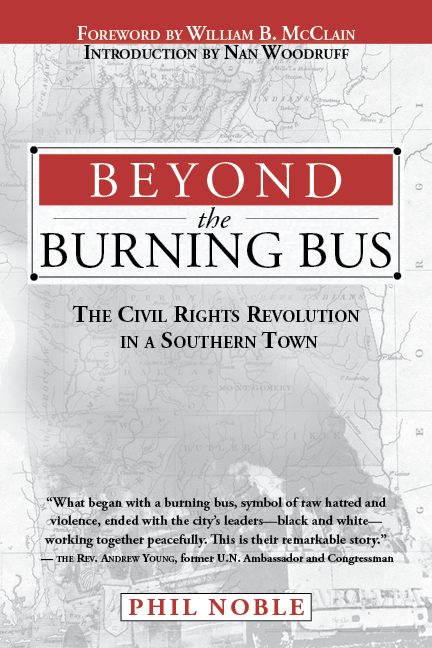 Beyond the Burning Bus: The Civil Rights Revolution in a Southern Town is available from NewSouth Books or your favorite bookstore. 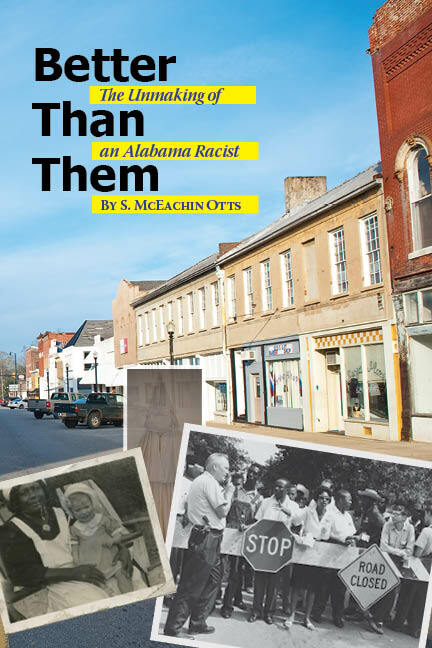 The Dothan Eagle recently profiled S. M. “Mac” Otts, author of Better Than Them: The Unmaking of an Alabama Racist in connection with Mr. Otts’s presentation at the Houston-Love Memorial Library. The feature recounts the story of a young man ready to assault civil rights protesters who grew to become the adoptive father of an interracial child, dedicated to improving relations between blacks and whites. The descendant of plantation slave owners, Otts was reared in the mentality of racism. His personal attitudes began changing during his college years. His memoir recounts an incredible transformation. The Mac Otts of 1965 probably wasn’t interested in talking out his issues. Today’s Mac Otts wants others to realize how transformative honest discussions can be. With Better Than Them Mac Otts offers a compelling contribution to the contemporary conversation on race. Better Than Them: The Unmasking of an Alabama Racist is available from NewSouth Books or your favorite bookstore.